Carlos Ghosn: “You also must be in every market -- and it's not just Japan, Europe and the United States anymore but also Brazil, Russia, China and India." DETROIT -- Size matters in auto company survival, Renault and Nissan CEO Carlos Ghosn told an audience here today. 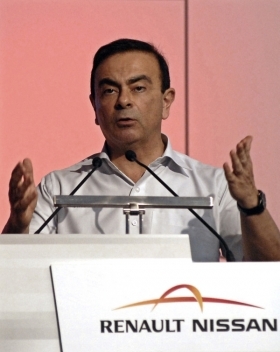 “No 3 million-unit carmaker can make it,” Ghosn said, explaining why his Renault-Nissan alliance forged an alliance with Germany's Daimler AG. Competency in one or two of the three skills is not enough, and only very large companies can afford all three, he said. Technology is getting more expensive. Automakers must simultaneously develop gasoline, diesel, hybrid and electric vehicle technology because they can't predict which technologies will prevail, Ghosn said. “You also must be in every market -- and it's not just Japan, Europe and the United States anymore but also Brazil, Russia, China and India. And you better be in Indonesia, too,” he said. France-based Renault and Japan's Nissan do not consolidate their financial results and in some ways remain separate companies, but they cooperate on platforms and powertrains and some manufacturing. Through a holding company, Renault owns about 42 percent of Nissan. That type of alliance is more flexible than a conventional merger, Ghosn said. He also cited the new alliance with Daimler -- initially to cooperate on developing a replacement small platform for Daimler's Smart division -- as a better way to cooperate. “Technologies are expensive and you need a partner because nobody can afford to do it all alone.” Ghosn said. He predicted that as the Chinese auto market develops, domestic Chinese automakers eventually will emerge as major players.